Visiting the Statue of Liberty is extremely popular with travelers coming to New York City. 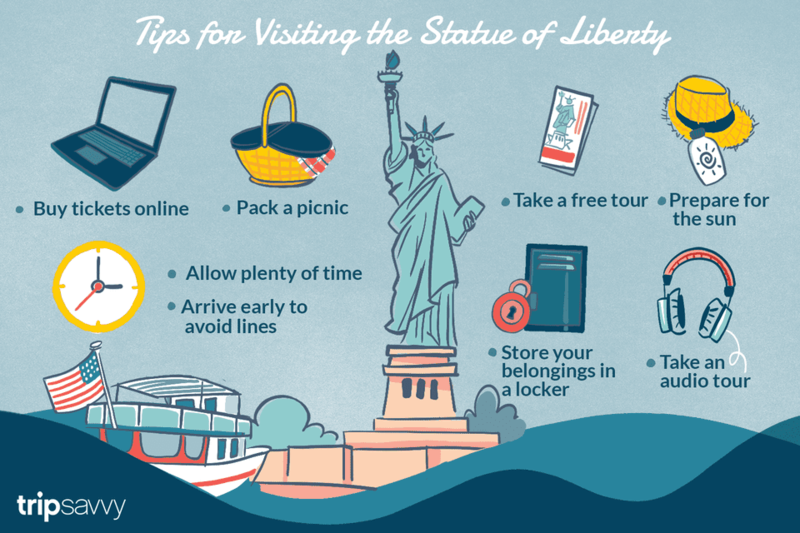 Especially in the summer, this can mean long waits for the ferry, but with these insider tips and advice, you can save yourself time and make the most of your visit to the Statue of Liberty. If you want to visit both the Statue of Liberty and Ellis Island, allow 5-6 hours for your visit. For the Statue of Liberty alone, it will take about 2-3 hours if you attend a tour. Arrive at the ferry 2 hours prior to your tour to ensure timely arrival. More: Can You Visit The Statue of Liberty & Ellis Island In One Day? Lines for the ferry to Liberty Island are longest on weekends in the summer, but even during the week, the wait can be over an hour to get on the ferry. Plan to visit the Statue of Liberty during the week if possible and catch the first ferry of the day to avoid unnecessary waiting. You can skip the ticket line and head right to security if you buy your ticket in advance. Tickets are time-sensitive so make sure you buy the right one for your visit and keep in mind the 24-hour cancellation/rescheduling option. More: What Ticket Should I Buy To Visit The Statue of Liberty & Ellis Island? There is plenty of space for enjoying a picnic lunch on Liberty Island. You can avoid the lines at the concession stand (as well as the overpriced, fairly mediocre food) by bringing along a picnic lunch of snacks from one of New York City's great gourmet grocery stores. Bring sunblock and pack water if the weather looks warm and bright. There isn't a lot of shade on Liberty Island and even with the breeze on the ferry, it's easy to get a sunburn. If you're making the trek up to the Statue's Crown, you'll definitely want to bring water along. It is typically much warmer inside the monument than it is outside during the warmer months, but it's not climate controlled inside the statue, so in the winter you will probably still want to wear your jacket. There are bathrooms on the ferry, as well as on Liberty Island and Ellis Island. The bathrooms can be a bit of a walk once you're exploring the island, so make sure little ones have a chance to use them when you're close by to avoid having to run across Liberty Island to avoid an accident! Tip #7: Take a Free Tour! There are free, ranger-led tours of Liberty Island offered daily. Tours depart from the flagpole on Liberty Island and last roughly 30-45 minutes. All-ages are welcome on the tour, which covers how and why the statue was made, the history of Liberty Island, and many fascinating aspects of the Statue's importance. These tours are completely free and don't require advance reservations. Check at the Information Center on Liberty Island for the schedule of tours. The audio tour is also free, so that's another great way to learn a lot when you visit Liberty Island. It's available in many languages, so it's a great option if the English-language Ranger-led tour or the tour schedule don't work for you. Only visitors with pedestal and crown access tickets can visit the Statue of Liberty museum and have a chance to see the Statue's original torch. The museum itself isn't very large, but it offers a great deal of insight into the history of the Statue and the excitement around it. I think it helps visitors better understand and appreciate the importance of this national monument. Tickets for these tours are limited and popular (crown access tickets usually must be booked about 3 months in advance, while pedestal access tickets are usually available 2 weeks in advance), so reserve in advance online or by calling 877-LADY-TIX. If you're going inside of the Statue of Liberty, only small purses and camera bags are allowed inside the monument (and will be inspected). There are lockers for rent ($2 for 2 hours) in the Liberty Island gift shop. Keep in mind that the interior of the Statue isn't climate controlled, so if it's cold out, you'll still want your coat and if it's hot out, you will want your water bottle to keep you hydrated while you climb. It's easy for kids to get bored, but the Statue of Liberty has several activities that will help kids stay engaged when they visit. The included audio tour has a children's version available. It's most appropriate for kids ages 6-10 and is available in English, Spanish, French, Italian, and German. For children 7-12 there is a Junior Ranger Program available. They no longer have booklets available on Liberty Island, so you'll want to print out the program in advance and bring it with you. Upon completion, bring it to the Information Office where a park ranger will sign your certificate and you'll get a badge. Your kids might also enjoy collecting stamps at various National Parks, including the Statue of Liberty. You can get your passport stamped (or purchase a NPS passport if you don't have one already) at the Information Center on Liberty Island.